Self sticking, waterproof envelopes are printed with Packing ListInvoice Enclosed in bold letters filling up most of the front window. Permanent adhesive sticks firmly without moistening so envelopes are easy to apply to packages. Waterproof poly material protects paper from water and oil splashes. 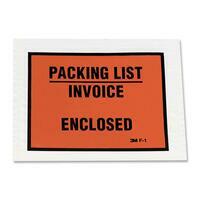 Packing list envelopes feature an end seal and back loading style with a visual window.